With all the snow and ice that’s piled up in the Northeast and other parts of the country right now, we thought it was about time we put it to good use! 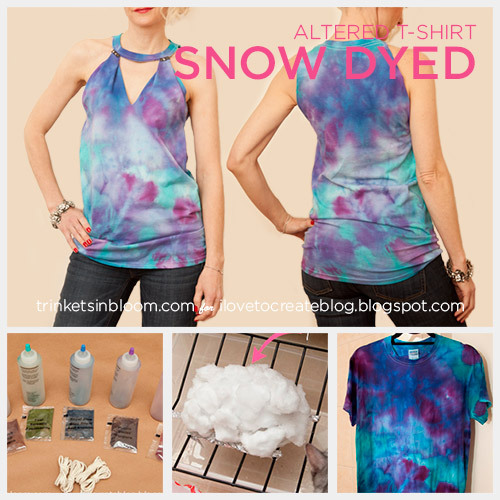 Create unique and amazing colors and patterns with Snow and Ice Dyeing it’s a super easy and fun way to dye fabric. This would be a great project to do with kids. 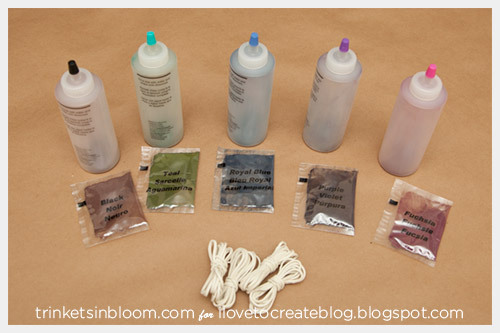 I really love this technique for dyeing. It creates some amazing color mixes and designs and it does all the work for you! In the summer you can do this with ice cubes! 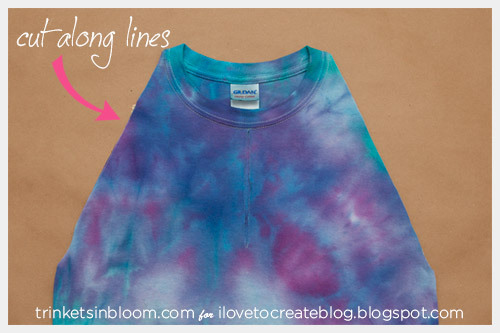 I think this is my new favorite way to dye fabric! 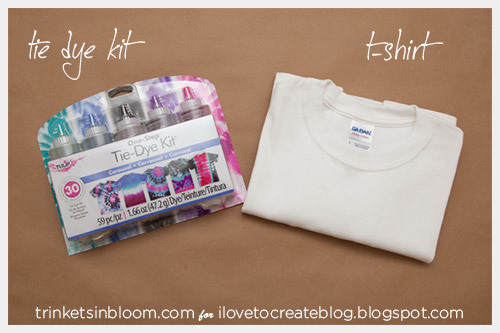 There is a lot of dye included in the Tulip Tie Dye kits. I only used about half of what was in the bottles. I didn't need to use any of the dye from the packets. 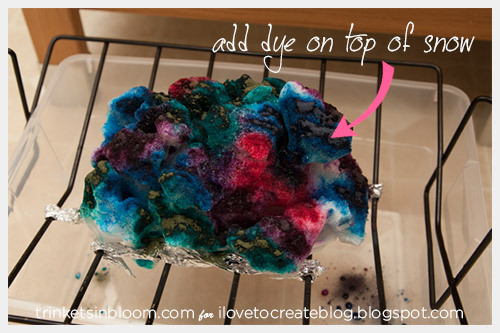 You don’t want to do this project in your sink since you will be waiting for your snow or ice to melt for the dye to set (and that can take awhile). 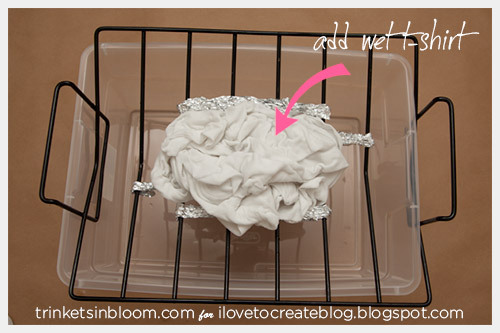 Place a metal screen or something in the bottom of your tub to keep your shirt from sitting in the dye as it melts. Try to keep it up at least an inch or two. 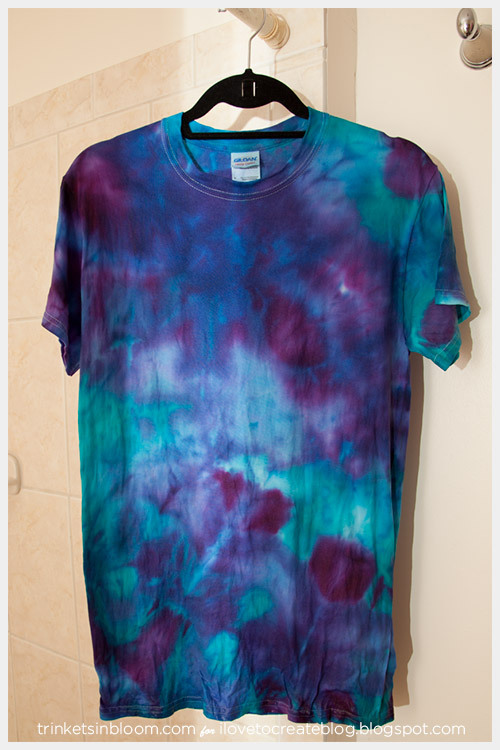 Get your shirt wet and tie it like you would for tie dye or just scrunch it up, which is what I did. Place your shirt in your tub on your screen. Cover your t-shirt with snow or ice. The cat was so fascinated by the fact that I had snow in the house I couldn't get a picture without my little furry assistant! 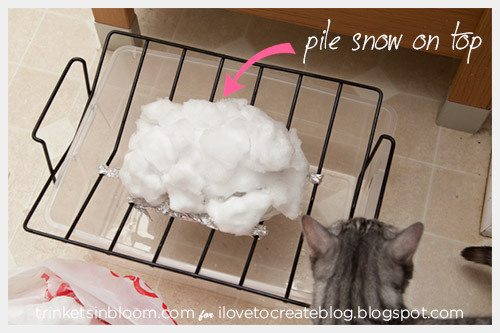 Sprinkle your dye powder over your snow or ice. Here’s where you can have some fun! You can decide what colors you want where, just remember that as the snow or ice melts your colors will run into each other and mix. You can use this to your advantage and make greens, purples, oranges, browns… go crazy! Even after the snow melted I left my t-shirt to sit overnight. 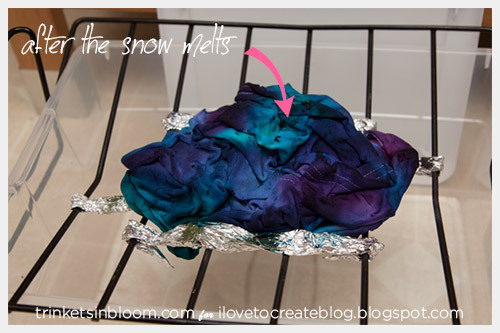 I was concerned about the dye not setting because of the cold from the snow. But I was really surprised at how well the dye took. Before I let it sit overnight I poured the dye from the bottom of my plastic tub out. I was concerned that the cat would get into it. That’s why you don’t see dye pooled in the bottom of my tub. When your snow or ice is all melted take your t-shirt out of your tub and rinse with cold water until the water runs clear. Wash in the washing machine to make sure all the dye is out. 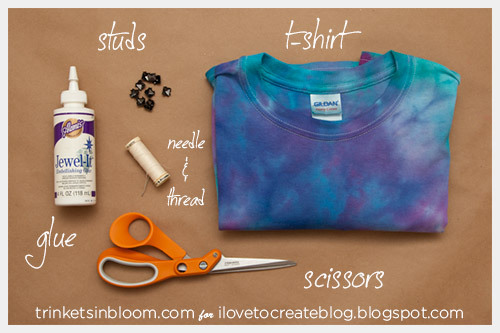 Now, you can wear your t-shirt as is or cut it up and make something fabulous! 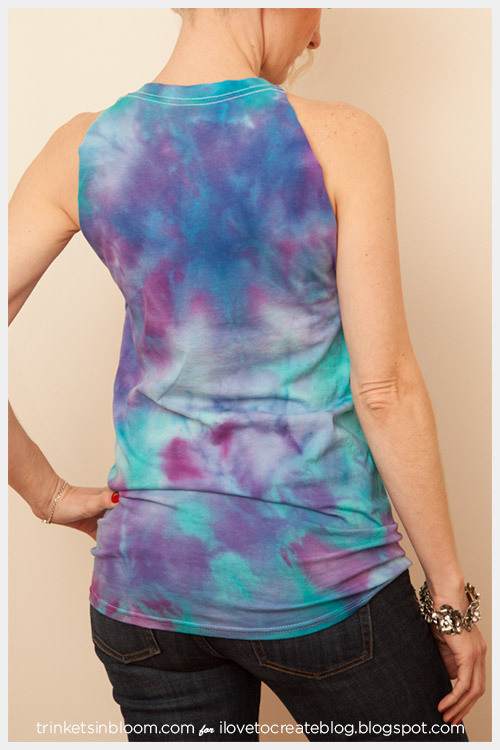 I cut up my t-shirt into a summery halter top. (I’m thinking ahead to summer!) 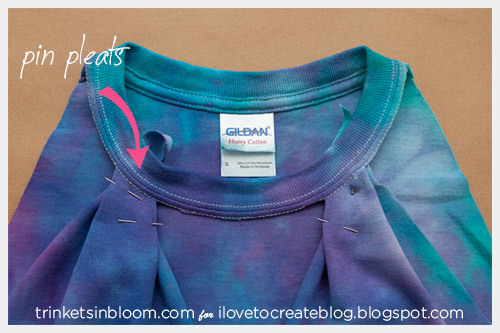 This can be done very easily with or without sewing. 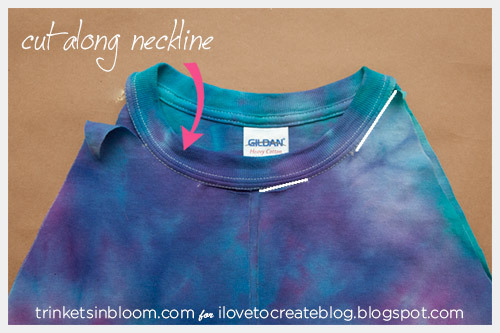 Lay your t-shirt out on a flat surface and draw straight lines across from the bottom of the arm holes to the center side of the neckband. Find the center front at the base of the neckband and draw a straight line down about 5 ½ to 6 inches. 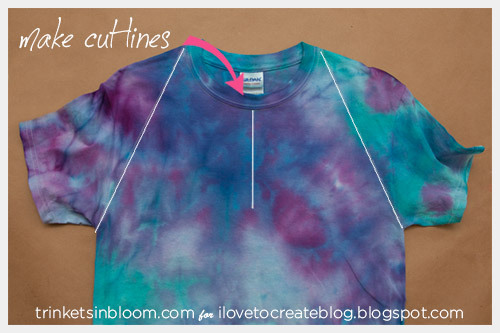 Following your lines cut off your sleeves and cut a straight line down the center front. From where you cut your sleeves off and the center front measure in along the neckband about 1 ½ inches to 2 inches on either side and cut. 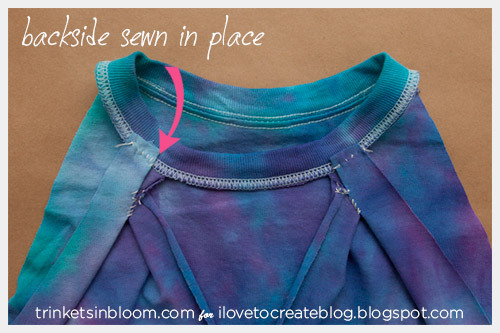 Pleat and pin the sides of your fronts under along the neckband. Using your needle and thread carefully sew your pleats into place and then trim off any excess fabric. 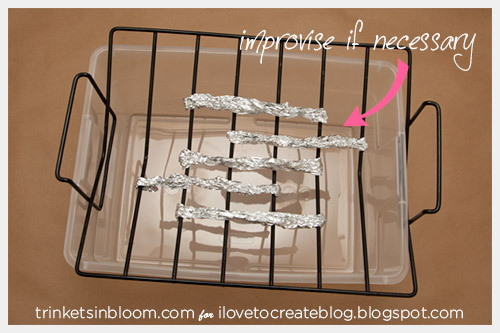 You can also do this with fabric glue. The studs I used had prongs on the back, since the fabric was too thick to push them through I folded the prongs over to make a flat back. 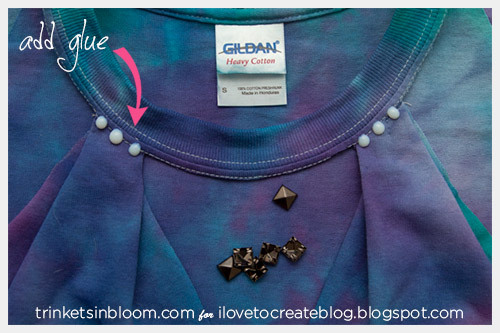 Using your Aleene’s Jewel-it glue add some drops of glue along the neckline where you want to add your studs or beads. If you are using metal studs or metal backed stones you will want to wait about 10 minutes before adding them to your glue. This gives the glue time to set a bit so it will hold the metal better. 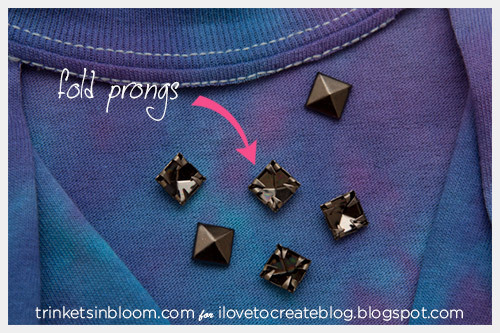 To see more fashion DIY tutorials, please check out my blog Trinkets in Bloom! Thanks! I'm a fashion DIYer inspired by runway fashion, street style and a love for vintage.